We all know someone who's been hangry. They're irritable and they need to eat quickly. When we're on the go, most of us resort to finding a fast food restaurant or bringing along a granola bar. But what if there was a better way? Hangry is the first app of its kind that lets you find nearby restaurants, book a table, and order from the menu, directly from your phone. By the time you arrive, both your table and your food will be ready. This full-stack approach ultimately led to the best version of the app. In the following, I will discuss the key steps and iterations involved in the development of my solution. Although I knew that people got hangry easily, I needed to identify the reasons why, and the resolutions that most people resorted to. I set out and did some user research with some surprising insights. Farrah was a pivotal persona during my initial research stage. It was after speaking with her that I learned about the urgency involved in feeding two young boys. Jason, a busy restaurant owner, told me how one of the major food vendors calls him up daily and pitches their food delivery service. He also told me how they want a 30% cut of his margins. Many of the major food apps live in silos. Few of them let you dine-in at a restaurant and have your food ready for you by the time you arrive. From my research and findings, I put together a comprehensive business model canvas that directed me through the rest of my design process. Next, I began working on user flows and wireframes, which evolved into multiple iterations. I asked the user to enter names to individualize orders and make the experience easier for servers, but I learned from feedback that when people are hangry, they just want to order food. Colour - When people are irritable I thought it made sense to present a cool and calm colour palette in the form of shades of blue. I also incorporated some strong reds/oranges to remind the user that it’s a food app. In the first iteration the brand felt too corporate, so I lightened it up with some aqua blues. Typography - I chose fonts like Montserrat and Open Sans to ensure legibility throughout the app, especially in the food menu areas. Again, the first version felt too stiff, so I found a fun font called Playlist that completely lightened up the experience. Personality - To create a sense of fun and pleasure I used a monster mascot in my branding, the app icon, and during on-boarding. You’ll notice that the logo has monster ears so that users enjoy the experience, especially when they're hangry! Watch the video below to see how the app reserves a table and places an order, or try the demo yourself. Simple is better - I lost track of the urgency of the need to dine quickly in my initial steps of the app. 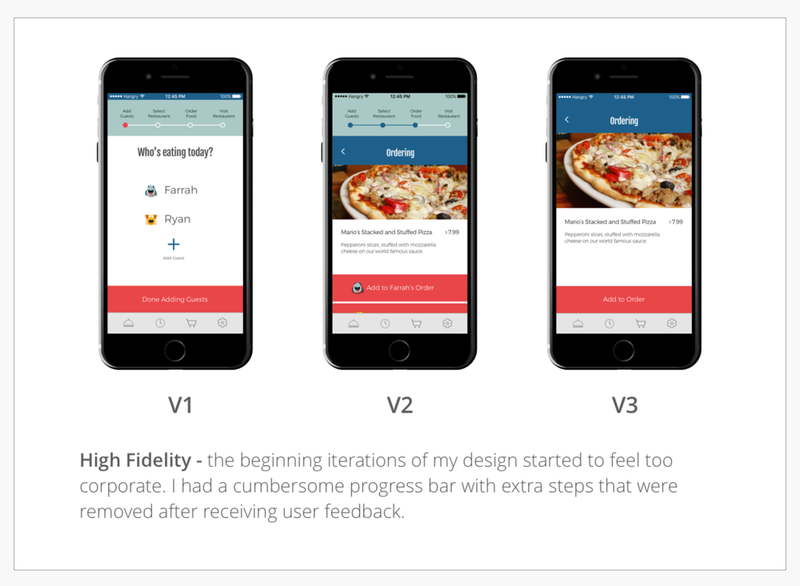 After user testing I realized that simple is better, and I streamlined the entire user flow. Delightful is just a font away - the final look of the app looked entirely different by simply changing a colour and a font, which was a huge relief.